An 1863 church fire in Chile killed between 2,000 and 3,000 people, placing it atop our list. 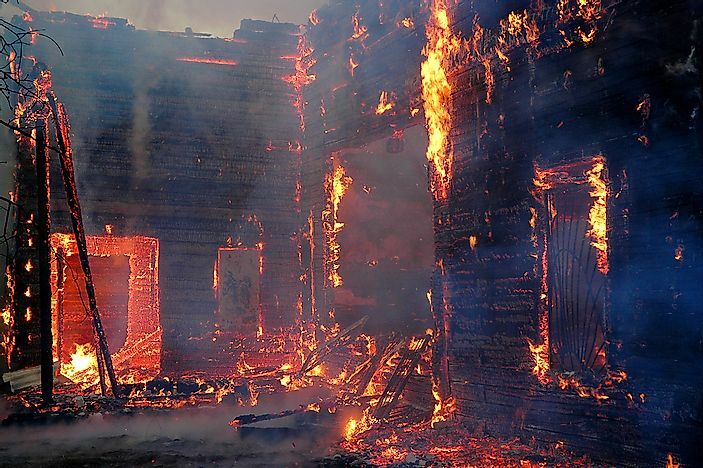 Large building fires can have disastrous results. For many, death by fire is the worst possible scenario that could ever enter their minds. Fires can destroy homes, places of business, entire cities and forests, and, worst of all, take human lives, sometimes en masse. Fires can be caused by natural events and/or human activities, such as earthquakes, lightning strikes, human error, and intentional arson. In this list, we look at the deadliest fires in recorded human history to have been confined to single buildings. All of these events occurred in public places, including one school, one church, and eight theaters. On the 23rd of December, 1995, when the entire DAV Public School was getting ready for a prize distribution ceremony among the children there, a fire broke out in a synthetic tent during the annual recognition of achievements gathering, killing 540 people. The date of the accident was only 2 days before Christmas in 1995, and the death toll included many schoolchildren as well as adults. Another grave disaster that struck in Tianjin, China at the Tientsin Theater was this fiery accident. Killing 600 innocent lives, this fire was one of the most major fire-related accidents in Chinese history, taking place on May 20th, 1872. One of the most tragic structural fire accidents to have shaken the entire city of Chicago, Illinois has to be this one, taking place at the Iroquois theater in the city. The fire had disastrous consequences, and killed 602 people in the year 1903 on December the 30th. On the 13th of February, 1937, a blazing fire accident killed 658 people who had come to watch a movie at the Antoung Movie theater, in Nantong, China. Yet another movie theater in China makes the list. In this event, a fire broke out killing 667 people who had come for watching a movie in the year 1977. The cinema hall fire was one of the scariest incidents that had ever happened to this Chinese metropolis. A circus was going on when this fire broke out during the performance, and then spread rapidly setting the whole theater on fire in the process. The year was 1836, and this was one the most serious incident to have ever beset the Lehman Theater in St. Petersburg, Russia. Around 800 people died in the accident. In June of 1871, around 900 members from the audience died while the largest theater in Shanghai caught fire. This was one of the most tragic public accidents to have ever occurred in China up to that point in history. On the 1st day of May in 1845, around 1670 people died at the Canton Theaterin Guangzhou, China when a fire broke out during a performance. This was another very tragic accident, and one of the most deadly blazes to have taken place in the 19th Century, and was heart wrenching for the entire country. On the 2nd of August, 1893, a fire had broken out from the theater's fuel-lit lights, and had spread to the mats that were roofing the entire stage and hall areas. Over three thousand people were present, and of these around 1,995 people were killed in this accident at the theater in Kamli, Japan. There were many people who even took advantage of this chaos, as they looted the neighborhood during this melee's aftermath. The earliest major single building fire in history, and one that killed over 2,500 people, was in the city of Santiago, Chile in 1863. The fateful day was the 8th of December of that same year when this Jesuit church was set on fire. During this night of religious festivities, the gas lamps and oil lamps in the altar caused a fire. The veils that decorated the church caught fire, and the blaze rapidly moved to the wooden roof, and soon was seen engulfing the entire church in no time. The people were left only the main entrance as an exit, thereby causing a stampede-like situation and trapping everyone inside the inferno.